It’s a common question that has become a bit of a cliche, used as an “icebreaker” for the first day of class or for “get-to-know-your-coworkers” meetings, and a question for which, for many years, I never had a satisfactory answer. Sure, there was that fun vacation, or the day I graduated from high school, but none of them seemed important enough to qualify for “BEST DAY EVER!” status. But three years ago, I figured out the answer to that question. And like many women, my “best day ever” involves flowers, a white dress, a new ring, beautiful music, and a handsome guy standing at the foot of the altar watching me as I walked down the aisle. For many couples, their wedding day is a representation of their love and dedication to each other, a day in which they pledge to remain together for the rest of their days, no matter what troubles come their way. But for a Catholic couple, it is all these things and SO MUCH MORE. Christ raised marriage from a natural bond to a supernatural bond, a sacrament. We know that a sacrament is “an outward sign instituted by Christ to give us grace.” So not only do we get all the natural benefits of marriage on our wedding day, but, through the sacrament, we also get the supernatural benefit of sanctifying grace: that beautiful gift from God which purifies our souls and makes them holy; sanctifying grace is what helps us obtain eternal life in heaven. And while my wedding day from a strictly natural perspective was the “best day ever” – I now get to spend the rest of my life with the person I love the most, and to have cute children with him – it was likely also supernaturally my “best day ever.” The Sacrament my husband and I received that day opened up the floodgates of God’s grace for us as a couple, and gave us a specific path to lead us to heaven, as long as we cooperate with those graces. In marriage, while our first physical gift to each other is the gift of our bodies, our first spiritual gift to each other is the gift of sanctifying grace. Physically, we become sharers in God’s creative power through the marital act, in which a new soul has the potential to be created. Spiritually, we become sharers in God’s sanctifying power through our ability to give supernatural life to our spouse through sanctifying grace. This supernatural life – sanctifying grace – is our share in God’s life. Therefore, in every sacramental marriage, the husband can say that his wife is a means by which he returns to God. The wife can say that her husband is a means by which she returns to God. When we stop to dwell on this for a moment, we realize how absolutely incredible and unique the marriage bond is. Not only in the physical sense, in that we can become co-creators with God in bringing new life into the world, but also in the spiritual sense, in that our actions have a direct correlation with our spouse’s eternal salvation. How awe-inspiring, and what a precious gift those of us with a vocation to marriage have been given! We aren’t in this alone; we can rely upon each other to achieve sanctity. This is the only relationship in which our actions are directly responsible for the other person to receive grace! God truly wishes us to be sanctified through our marriages. 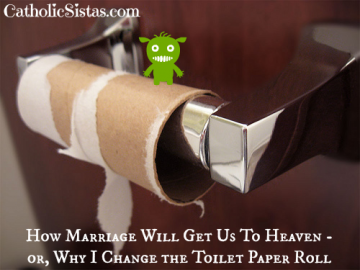 So how can we best make use of this awesome benefit of the Sacrament of Matrimony? How can we direct the channel of grace towards our spouse? We have the grace available to us; we simply need to ask for it, not only through prayer, but also through our works. When we do something kind for our husband, he receives grace for it along with us. Each time our husband does something kind for us, we, along with him, are also receiving grace from that kind act. So do something kind. Prepare your husband’s favorite dinner. Iron his pants for him. Get up a few minutes before him and make his coffee. Do a small chore that he especially dislikes. If he has a preference that something be done a certain way, do it out of love for him. In our house, that particular thing is the perpetually empty toilet paper roll (the TP is usually 6 inches away on the counter). It’s a very minute detail, but something that bothers my husband. So I try to make the effort to change the roll when it’s empty, even though it’s something that doesn’t bother me in the slightest. For others, it might be making the bed or having clean t-shirts in the drawer without having to dig through the dryer. Whatever it is, perform that selfless act out of love for your husband, for that selfless act will not only bring peace and joy to your marriage, but also be spiritually rewarding for both of you, as you “store up treasures for yourselves in heaven.” (Matt. 6:20) Little acts of grace, all the time – and marriage is full of these opportunities! In a culture that is so immersed in self-gratification and self-sufficiency, even a small sacrifice for our spouse flies in the face of modern advice on marriage. We are told to make ourselves happy first, then to worry about others. But for us to reap the true spiritual benefits of marriage, we must be willing to sacrifice, and to sacrifice GENEROUSLY. A sacrifice done begrudgingly will have little merit; a sacrifice done willingly and generously will reap great rewards, for “God loveth a cheerful giver.” (2 Cor. 9:7) We can and must be sanctified through our marriage. None of our earthly pursuits matter if we fail in our heavenly goal. Let us be inspired to work towards that “greatest joy”!